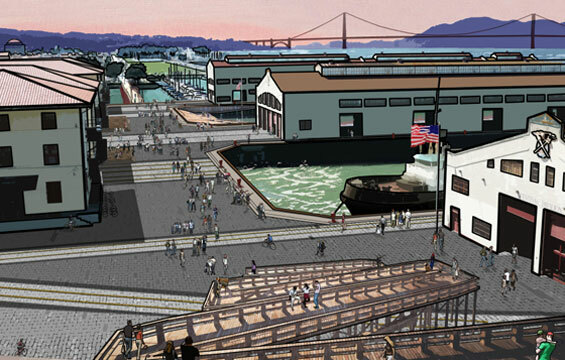 Fort Mason Center has selected West 8 as the winner of its 2012 design competition for the 13-acre waterfront campus in San Francisco. 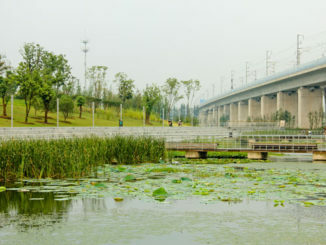 The three-month long competition sought creative and practical design concepts to further enliven and integrate the site. The design will enable Fort Mason Center to realize its full potential, both as a vital and stimulating location for arts and culture, and as an attractive destination for enjoyment of the site. 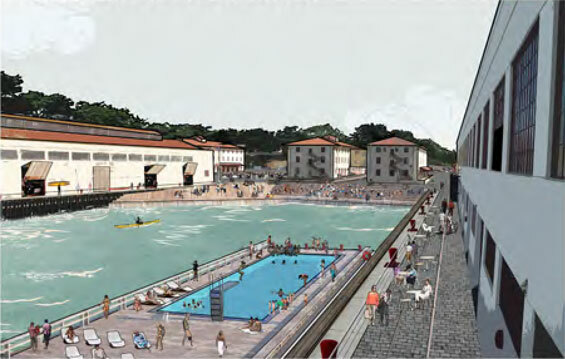 West 8’s design calls for seven key strategies that bolster and preserve Fort Mason’s legacy and naval military identity while activating the water’s edge, improving pedestrian access and parking, and enlivening spaces for expanded public programming and arts. Pier One is reinvented as a publicly accessible art-oriented hotel, while the other buildings diversify programming to create a robust cultural destination centered around lively public plazas. Waterside improvements bring wooden decks, floating pontoons, and bridges that weave the site together, bring people to the water’s edge, and showcase amazing views of the shore and Bay.